You are currently browsing the tag archive for the ‘goodreads’ tag. Adam Sherman has guarded the dark secrets of his past. Davie Prescott is the one person he doesn’t have to hide from. When his past catches up to him, he learns that there’s a lot more at stake. Adam is prepared to give Davie up in order to protect her until he learns that she’s got a secret of her own. A great read with characters I cared about. Adam Sherman is a computer expert and a womanizer who is dedicated to “Bedding but not Wedding.” When he becomes aware of Davie Prescott, a twenty year old student who works part time at the same place that he does, he pursues her.Davie feels an equal attraction, but she is not an average 20 year old. When Adam makes his move to take her to bed, she confesses that she is still a virgin. His reaction is the exact opposite to what she might have expected; he is not thrilled that he is her first. In fact he pulls away in shock and says he will not make love to her. Then he gets out of the bedroom as fast as he can.Davie is humiliated and angered, assuming that her lack of experience had been a turn off for him.Adam is still attracted to her and tries to smooth the troubled situation between them, but she is not willing to open up to him again. Adam has a dark secret that he has been hiding, but eventually his past catches up to him in his work place. He shares his secret with Davie and is shocked that she doesn’t turn away in disgust; instead she is supportive. Then he learns that she has been hiding a secret too. They both have deep emotional wounds, and together they help each other come to terms with the problems that have created turmoil in their lives. Their commitment to each other gives them the courage to face their problems and make a new life. I really enjoyed this book. It was fast paced, full of twists and turns, mystery, danger and tragedy. I cared for these two characters. I was reminded again that sometimes people have no control over the circumstances in their lives and without love and support from family and community, they flounder in shame and fear. Don’t miss a great read. I’ll be looking for more books from Chelle Cordero. 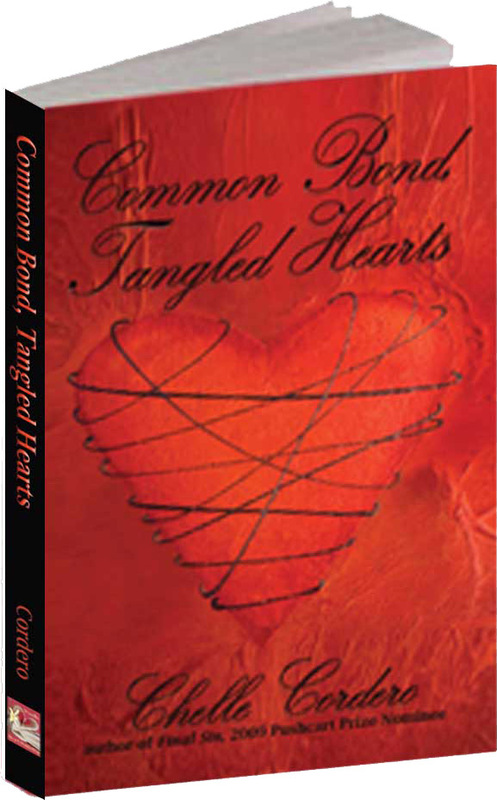 There are three reviews for Common Bond, Tangled Hearts listed in the SONY Reader Store; one review is only 2-stars because “It reads like a Danielle Steele book” and the reader is not fond of Danielle Steele. However, Danielle Steele has always been one of my favorite authors so I am really flattered at the comparison!